tinue to keep that park up. on the nature of holiness. sanctity was that of "time." the Jewish people oi Israel. receives a special greeting of "Shalom"
from Betty Ho mans and Harry Rosen. ed about the places the South Broward contingent will visit. out to other little cities." Temple Sinai, 1201 Johnson St.
buying cemetery property in Florida. he was worried about the cost. prearranged funeral program. * Here are the facts Sam got. It answered Sam's problems It could answer yours. ..... *. The most respected name In funeral preplanning. Dina Kaye and Gloria Levin. I. From left, Dr. Saul Singer,' Evelyn Stieber, guest speaker Arieh Plotkin, Dr.
Howard Barron and Dr. Irving Karten. Barron was a rousing success. Dr. Barron, the Federation's campaign chairman, said he was pleased with the turn-out. do extremely well with Premiere Gifts." dation on which the Pemiere Gifts campaign will be built. tion, and foresight," notes Dr.
vided half the funds for the study. will return to Israel in August. Technion. Prof. Hill and Dr.
ment and selected social services. already agreed to these demands. aad the Future ef'the Jewish People Reuven P.
groups with hardly any interaction between them. tragedy which otherwise hes ahead. A new book by Charles E.
significant factor in Jewish life. is published by Summit Books. thodox and Conservative Jews require such a get. from this second union is illegitimate a mamzer. mamzerim being born in the next decades. for fear of involvement in such "intermarriage." in Jewish survival wfll deplore. on the part of Orthodox rabbis to compromise. that process is now. 'If not now. when?" tumcmrrtOM HATES Local A#a. S3S0 Annual 0 Taar Ma-mum V) "***?****!!! every stripe. They are the story today." said that he would certainly focus on the latter. more powerful. Besides, nuts make better copy." with America, rather than on what's right with it. events there. It is not Israel. Debbie Brodie Stevens at 921-8810.
sion to Israel will be in Israel from Oct.
at its Oct. 14 meeting. ment to the 1984 Foreign Aid Bill. The BEF will meet at 5:15 p.m. !! PULL OUT AND SAVE!! "M" is member; "NM" is non-member. Wednesday eve of each month. $3.50 Per session J.C.C. Member A.M. Time.......9:30-11:30 a.m.
$12.00 Series JCC. Members P.M. Time.......7:30-10:00 p.m.
$18.00 Series Non-Members P.M. Location......at the J.C.C. BABYSITTING AVAILABLE A.M. SESSION ONLY. Group; Grades 5-8 TBA 4-5 p.m.
contact Mark B. at the Center, 921-6611. JCC Regional TWEEN Group forming activities every other Sunday. CREATIVE POTTERY Mon. 6:30-9 p.m.
tribes. Below you will find s schedule of our major tribal events. We are also offering many sfesjaft s.
first Tuesday of the month, 7:30 *, at e.
wish to help increase the activities. wiunit Centers of South Broward. fom 9 a.m. to 5 p.m.
ts, butwoes so out of 28 locations. I grss oots fundraiaing campaign. R*l|y Round the J Phone-a-thon. brought to and from the Center. events are celebrated at the Center. A hot Kosher meal is served to needy clients each day in the Center. Volunteers meet once a week and are seeking motivated hard workers. Staff counselors and advocates for senior adults charged with shoplifting. criminal justice system and prevent repetition of the crime. who live alone and would have no other means of preparing a meal. meet new people, see old friends, and discover new horizons. for the fall and winter. just chat, please call Mark Brotman at 921-6511. Reva Wexler 921-8810 for further information. more information, call Dene at 921-6511 or Ellie Eichler at 987-9843. "An Evening With Simon Wiesenthal" will be held on Nov. 5 at 7:30 p.m.
Sunday Champagne Brunch with us, don't miss out this time! Arts and we'll be there too! More information will be coming. 2838 Hollywood Blvd., Monday through Friday, 9 to 5. Center, we will accept registration by mail. FEES: All fees are listed next to each program. ANY REASON AFTER CLASSES BEGIN! are given in that case. than with a donation to our Scholarship Funds! donation is $5. You may designate the fund that interests you. Fund, EARLY CHILDHOOD: Early Childhood Fund. 10022. 1985. 539 pages. $27.50. condition of much of world Jewry. in a very lucid and exciting style. periences at the recent Kadima retreat. top leaders from the community. the people attending the seminar. of the United Jewish Appeal. ecutive vice chairman of the UJA. tlement of refugees in Israel. Dead Sea, a working kibbutz and W Aviv!" en's in the 9th-12th grades. ck by popular demand! Ms.
Bsday, Oct. 2, at 10 a.m.
is a $1 registration fee. fcion call Karen at 921-6518.
trials for a 4-week session. it 921-6518, 9 a.m.-2 p.m.
er. Price: $26 for 8 sessions. ublii, both men and women. Want to learn Israeli Dancing? October. Great fun and exercise! Oct. 3 followed by 8-week session. back a Hollywood landmark, but most of all. ioned interest in you. our customers. take place at 8:15 a.m. Monday. meet Oct. 6 at 9:30 a.m.
will continue Monday at 8:45 a.m.
Oct. 8 at 8 p.m.
Auditorium of Temple Beth El. Deadline for reservations is Oct.
Middle Bast and Latin AmerUaft. and Politics of the United States". news a great deal recently. breakfast can be paid at the door. upon the Congregation as a whole. Monday, Sept. 30 at 10:30 a.m.
bin School of Living Juda-sm. 9:30 a.m., Sunday, Sept. 29.
be given to various charities here. Yosmg Israel of Hollywood 3291 Stirling Road; 966-7877. Rabbi Edward Davis. services, 8:30 a.m.. 6:30 p.m.; Sabbath 8 p.m.; Sabbath rooming. 8:46 a.m.
School: Nursery. Bar Mitivah, Judaica High School. 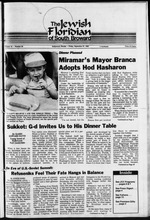 Temple Israel of Miraasar 6920 SW 36th St.; 961-1700. Rabbi Raphael Adler.
. I Beth El 1361 S. 14th Ave., Hollywood; 920-8226. Rabbi Samuel Z. Jaffa. Sabbath evening 8 p.m. Sabbath morning 11 am. Religious school: Grades K 10.
ty Drive, Pembroke Pines: 431-3638. Rabbi Bennett Greenspon. Sabbath services. 8:16 p.m. Religious school: Pro-kindergarten10. Tessaic Salel 6100 Sheridan St., Hollywood: 9694)205. Rabbi Robert P. Frazin. SkideU Sabbath services, 8:16 p.m. Religious school: Pre-kindsrgartest-8. with the joy of forgiveness. that we are changed people. men's underwear shapes, slims A supports! lance. Made ol 41% very light cotton woven with DuPont Lycra"
pnd whiteness after repeated washings. [rearing a better shape today! of Technology adds approximately 1,200 Israel's economy each year. join hands on Oct. 5. Broward County to the other. which is sponsoring the event. Hollywood, at the Diplomat Hotel. democracy and keep the fringe far from power. LENSES SLEEPING ON THE JOB. eye for another prolonged period. lens to absorb UV light, exposing the retina to possible UV damage. Common complaints include light sensitivity, glare and "pink vision." Hn/Ve flrof what It takes. ingers in the Catskill Mountains. tional president of Amit Women. if it was introduced in the U.S.
wait for the people to call for me." to ask, did you support Israel?" "Kahane Does Not Speak for Me"
and "Zionism: Yes, Kahane: No,"
ed that of the rabbis. tests got off the ground. testing against Kahane, as well. said was the core of the problem. n*r!7 peaa = -.a* ca*. Laat. nee aeae rf T* Ar. Modal: Israel Can Rely on the U.S.
mises on behalf of its citizens." Belgian Ambassador to the United States. your home or office today. 10:00 a.m. or 2:00 p.m. it! '-and on that we agree. dining, maid service, and emergency medical care should I need it. overlooking the pool, after also considering a studio and a two-bedroom. at The Court at Palm-Aire!" D 2:00 p.m. special seminar. ficials can direct protests to the above address. Tanya's father passed away in Sverdlovsk after suffering from Leukemia. Apt. 131. Riga. Latvian SSR, USSR. years of his imprisonment, the half way point! 666111 Irkutskaya Oblast. Ekhyrit Bulagatskv Rayon. worked as an electrician in an exhibition hall. disturbing public order. No witnesses were produced, although Mikhail demanded some. demanded one. The judge sentenced him to 15 days prison. find yourself in the Far East." might be fired from his job and without a job. he can be easily prosecuted. who wrote the "Jews of Hope." help your fellow Jews in Russia. of the Israelis is beyond question. Promise has turned into imft. The three activists are Isai and1""
ple all over the world for a ne^'. year of peace, health and prospen"
and to let them emigrate to Israel. 25 percent in the first half of 1986.
absolutely does not mean Israel. goal is a U.S. "dialogue with"
negotiations with Israel. The U.S.
That is why National Security i. .
Creative Business & Real Estate Investments Co.
whipped butter without the cholesterol. reless champion of human lilberty. tion affairs. "This year," Mr.
Federation of South Broward; Lou. use of the death penalty. the problems of rising terrorism. the problems of inierniurrniue. .
relocated in the Jericho area. did favor the death penalty. released this genie from the. free vote by its MKs. Tel Aviv. And it's really something to celebrate. serving kosher meals for those who wish them. Miami at (305) 874-5000, in Ft. Lauderdak? Pan ArrOfbu Cant Beat The Experience. 4/3/2013 5:43:33 PM Item title is required but not supplied!